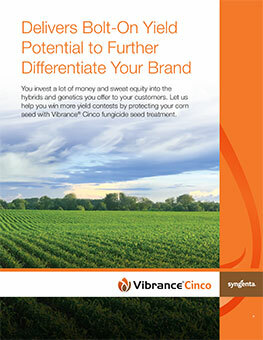 Vibrance® Cinco seed treatment contains five powerful fungicides with five active ingredients and five modes of action in one jug for the most consistent and comprehensive seed-applied disease protection on the market today. Designed specifically for corn, independent trials prove this seed treatment consistently out yields commercial standards to deliver a demonstrated bolt-on yield increase of two bushels per acre, which increases to 6.7 bushels per acre under heavy disease pressure. During 2017 field testing across 24 environments, Vibrance Cinco out yielded the new Acceleron® corn fungicide package that contains metalaxyl, fluoxastrobin and prothioconazole by 3.27 Bu/AC with a 71% win record. This yield advantage results from the powerful disease protection Vibrance Cinco offers, which leads to maximum root development, emergence, stand establishment, above-ground plant development and, ultimately, yield optimization. Vibrance Cinco can be combined with Cruiser® and/or Fortenza® insecticide seed treatments or Avicta® nematicide seed treatment for comprehensive disease and pest protection. Vibrance Cinco plus Cruiser provides excellent control of all three of the most damaging corn diseases and an excellent visual vigor rating compared to Acceleron Standard, which only provides excellent control of one of the top three corn diseases. Efficacy based on Syngenta studies using labeled rate of active ingredients. CruiserMaxx Corn 250 is an onseed application of Cruiser 5FS insecticide delivered at the 0.25 mg a.i./seed rate and Maxim Quattro fungicide. The trademarks or service marks displayed or otherwise used herein are the property of a Syngenta Group Company. All other trademarks are the property of their respective owners.